Every season there are teams who come out of nowhere to surprise the majority of experts and at least make a push for the playoffs thanks to either a breakout player, a new coach or new system that helps propel them to another level. We saw it with the Buffalo Bills among others in 2017 and now we’re going to look at five teams who could make surprise in 2018, either as an unlikely playoff team, or a team who could make a serious run at the Super Bowl. All five of these teams missed the playoffs in 2017 and they all currently rank outside the top 12 teams in the NFL in odds to win the Super Bowl. 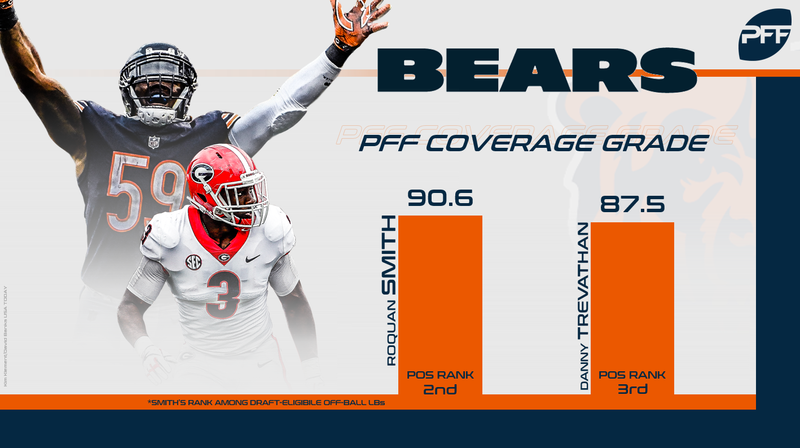 Defensively, they added talented linebacker Roquan Smith in the draft and he should form an impressive pairing with Danny Trevathan in the middle when the Bears are in the nickel, with Trevathan producing an 87.5 PFF grade in coverage last season, and Smith having multiple highlight reel plays in coverage at Georgia. In Deshaun Watson and J.J. Watt, the Texans have two of the most important players in the NFL coming back from injuries as we head towards the 2018 season. 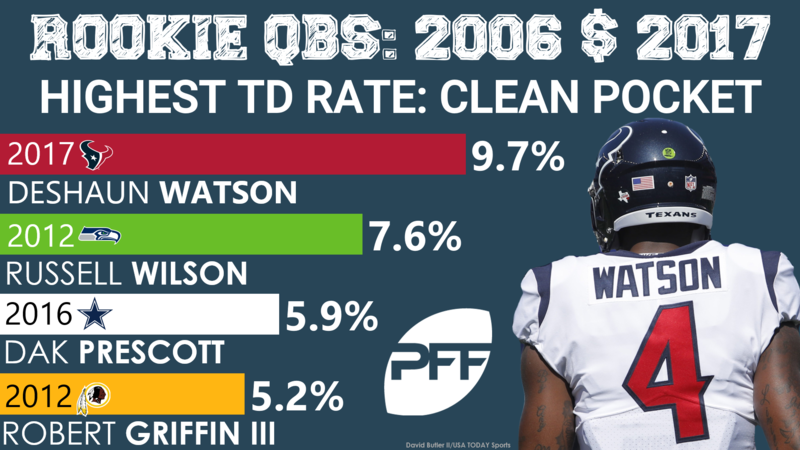 Watson flashed with some huge plays downfield in his rookie year before it was cut short through injury, ranking tied for ninth among quarterbacks with seven touchdowns on throws 20 yards or further downfield, despite playing just half the season. 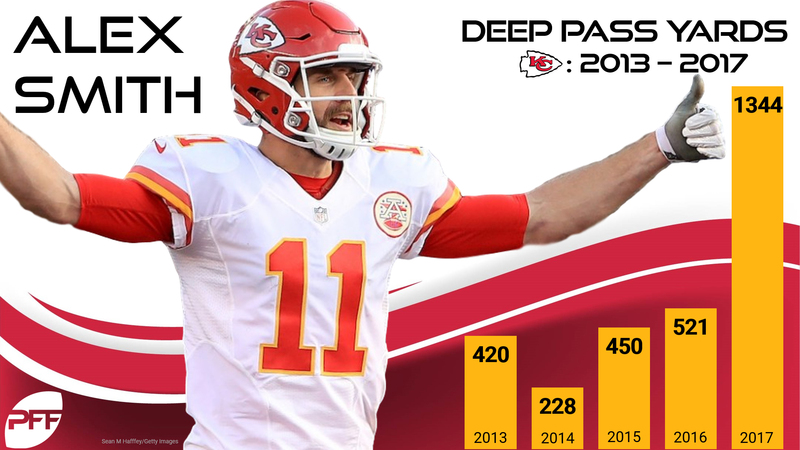 He also led all quarterbacks with an NFL passer rating of 124.1 on throws where he was kept clean from pressure, so if the Texans can keep him clean and healthy, big things could be on the horizon on offense. With the emergence of Aaron Donald, coupled with two season-ending injuries in a row, it feels like a lot of people are sleeping on Watt right now. Let’s not forget that this is a player who graded at 95.0 or higher every season from 2012 to 2015, and has destroyed opposing offensive lineman with ease when healthy. With Watt back healthy, along with edge defender Whitney Mercilus who racked up 76 total pressures in 2016 before missing most of 2017, joining Jadeveon Clowney again, the Texans have three potential double-digit sack players in their defensive front. The key to the Dolphins making a surprise push for the playoffs is getting quarterback Ryan Tannehill healthy, and keeping him that way. Tannehill might not be an elite signal-caller, but he has produced a PFF grade between 80.9 and 85.1 every season of his career so far. That will put you among the top 50 percent of quarterbacks in the NFL every season, and with enough help around him, he gives you a chance to win. The Dolphins have made additions on offense, adding guard Josh Sitton who has allowed just 18 total pressures on 856 pass-blocking snaps over the past two seasons and slot receiver Albert Wilson. Wilson replaces Jarvis Landry who dominated out of the slot, but Wilson was no slouch, producing a PFF grade of 77.1 and he will have the opportunity to flourish in the Dolphins system. Defensively, Robert Quinn is the big addition upfront, but despite him racking up 10 sacks in 2017, we haven’t seen any real consistency from him as a pass-rusher since his two-year performance between 2013 and 2014, with just 81 total pressures over the past three seasons. 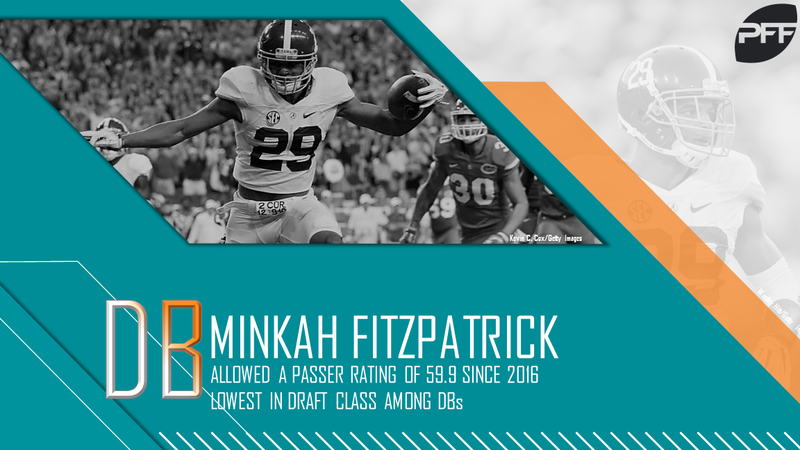 The key addition on defense is first-round defensive back Minkah Fitzpatrick, who showcased the ability to play safety and in the slot at Alabama, and should bring that versatility to the Dolphins. Would it really be a “teams who could surprise in [insert year here]” without the Chargers? 2018 has the potential to be different through, because this is a team with a defense that just might be the best in the NFL, and an offense that is set up to give Philip Rivers one last push. 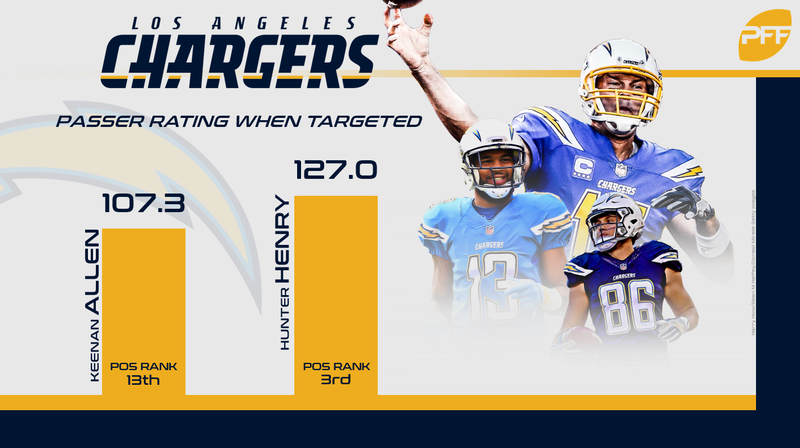 Healthier in 2017, Keenan Allen was one of our top-five graded receivers in the NFL while Hunter Henry was our second-highest graded tight end, and should see an increase in playing time with Antonio Gates no longer around. 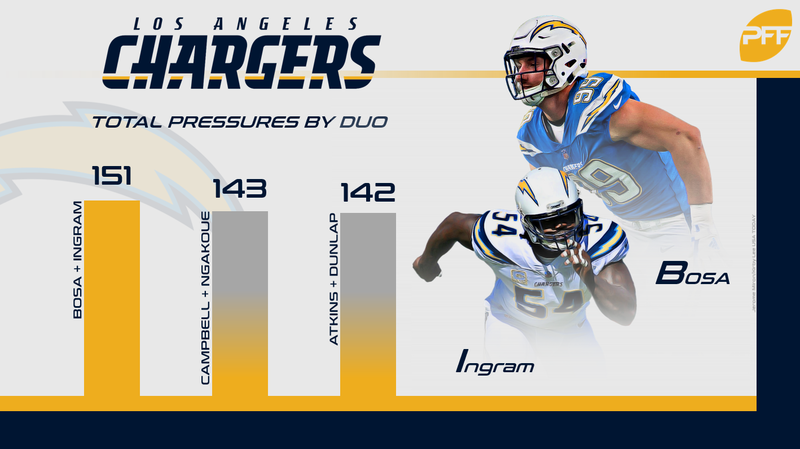 The edge of the Chargers defense should terrify opposing quarterbacks, with Melvin Ingram (91.9) and Joey Bosa (91.7) our sixth- and seventh-highest graded players at the position, respectively. They combined for 24 sacks, 23 hits and 102 hurries in 2017, and there’s no real reason to expect much, if any, drop off in 2018. Add in that they have our highest graded cornerback from 2017 in Casey Hayward, one of the most impressive rookies in the slot from a year ago in Desmond King and added talented in safety Derwin James out of Florida State, and this is a defense built to dominate this season.